Anderson’s work-of-art on wheels has been released online. German tuning firm Anderson has created one of the best-looking Aston Martin DBS&apos; we have ever seen, and we don&apos;t mean just on the exterior. The DBS Casino Royale is based on the DBS Gray Platinum Edition and features plenty of added power and style for a truly incredible ride. Starting with the power upgrades, the Aston Martin DBS Casino Royale features a new lightweight exhaust system with catalytic converters, spare tubes, headers and an ECU revamp for a total output of 572hp. This is a 55hp increase from the standard&apos;s 517hp. The aforementioned exhaust system is 46.2lbs lighter than the one it replaces. It has been finished in black, which goes along with the Casino Royale&apos;s blacked and gray exterior color scheme. It rides on a set of 21-inch Anderson wheels with bronze-painted brake calipers. Window tint and carbon pieces such as the front spoiler lip, side mirrors and rear diffuser finish off the special edition&apos;s exterior. Anderson has also added their aptly-named "language center," a remote-controlled valve system that allows for three different volume levels. The interior is where the Aston Martin DBS Casino Royale makes its mark. It features a carbon fiber package that would make even Daniel Craig jealous. It consists of carbon fiber air vents, ash trays, door sills, steering wheel, handbrake lever, center console, door handles and cup holders. Black carbon fiber leather and Alcantara along with orange seams finish the interior off in an elegant and unique fashion. 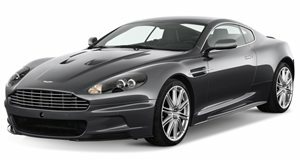 No pricing information has been released for the Aston Martin DBS Casino Royale, however as Le Chiffre said in the James Bond film of the same name, "I&apos;ll get the money. Tell them I&apos;ll, I&apos;ll get the money."